South Mountain Drive, Emmaus, Pa. 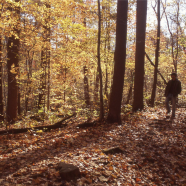 Visitors can enjoy hiking and mountain biking on nearly 34 acres of woodlands trails. Safe parking and environmental education kiosks are accessible near South Mountain Drive.